﻿ News Bharati - Now drive hassle free..! No need to carry original driving license and vehicle RC anymore..! News Bharati - Now drive hassle free..! No need to carry original driving license and vehicle RC anymore..! Now drive hassle free..! No need to carry original driving license and vehicle RC anymore..! New Delhi, February 6: Relieving the drivers and riders on street, the Ministry of Road Transport has very recently issued a document informing the masses roundly that they need not carry the physical copies of driving license and any other vehicle related documents for the verification purpose. Showing of the electric documents in relation is going to work out from now citing to the amendments made in the Motor Vehicle Act, 1988 and the IT Act, 2000. The Government of India has enabled the digital driving license and vehicle’s RC papers stored in DigiLocker, which will be now be legally recognised at par with the original documents. With immediate effect, the notification by the ministry is addressed to all the India State’s Principal Secretaries, All Secretaries of Department of Transport, DGPs/ ADGPs (Traffic) and all State/UT Transport Commissioners. This robust comes after the numerous grievances and RTI applications received by the Ministry of Road Transport where vehicle owners raised the concern that the documents available in DigiLocker or the mParivahan app were not being considered valid by the traffic police or the motor vehicles department. 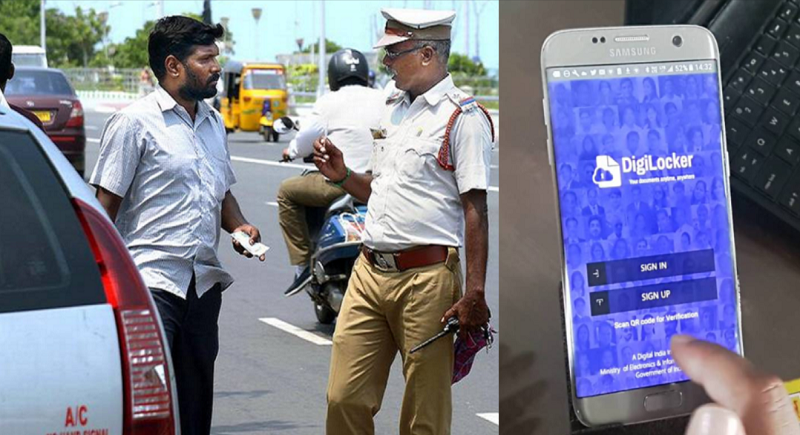 “The citizen can now produce the transport-related documents in physical or electronic form on demand by any police officer in uniform or any other officer authorised by the state government in the regard”, the statement reported. “The citizens must note that a scanned copy of any of these documents will not be acceptable to the authorities and people will have to store the required vehicle documents on their smartphones on ‘DigiLocker’, an application controlled and operated by the Central government”, the office confirmed. The service is part of Digital India scheme, which allows people to store certain official documents on the cloud while eliminating the need to carry important physical documents. People can easily download the app from Google Play Store or App Store and the documents will automatically get validated once uploaded in the app as they are directly issued by the concerned authorities, the authorities firmed.